← Don’t waste that tea! I’ve spent a few days doing some more dyeing so that I can actually make something. 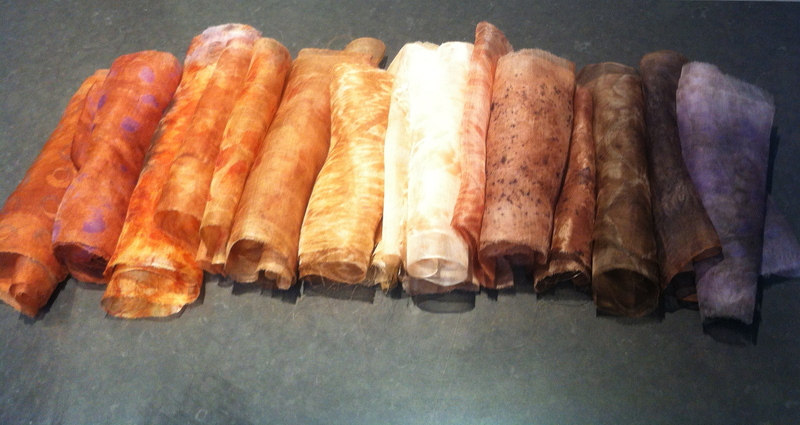 I now have a good spectrum of fine silk organza dyed with avocado skins, red and brown onions, casuarina leaves, purple carrots, pomegranate and some rust and tea. I should be able to do something with these! Another group I belong to, Designing Women, is having an exhibition starting on Thursday 23 October, almost a week after the MELD one, Hidden Revealed Transformed, which opens on Friday 17 October. I’ve done all the work I want to for MELD so have designed something for the DW exhibition, Seams and Layers. Beautiful colours Margaret – almost good enough to eat! Well, I’m conscious that this activity is only possible because I do have enough to eat…..Definitely a first world endeavour!